Whenever the ultimate in terms of rideability and Enduro performance is required, the KTM 350 EXC-F shows off its strengths to the full. The compact, lightweight DOHC (double overhead camshaft) engine, the low overall weight and the perfectly tuned chassis make this bike the kind of friend a rider needs when the going gets tough. Its precise handling enables it to master whatever challenge comes its way with ease. The longer the race distance, the more the rider benefits from the easy handling and efficient engine characteristics that keep fatigue at bay and guarantee maximum riding fun. What counts in the E2 class above all are strength, agility and staying power – that applies to both the rider and his Enduro. The 4-stroke engine of the KTM 350 EXC-F with state-of-the-art electronic fuel injection offers amazing power that is available over a broad rpm range. This is backed up by a dynamic and precise power delivery, which the rider can call on effortlessly. It ultimately means the KTM 350 EXC-F can even outperform 450s in the E2 class. The single-cylinder engine has been built to the latest technical standards and incorporates a DOHC cylinder head with DLC (diamond-like carbon) coated cam followers, flow-optimized ports and a robust bridged-box type 88 mm diameter piston. The compact engine architecture has made it possible to centralize the masses around the bike's optimum centre of gravity to deliver outstanding handling. 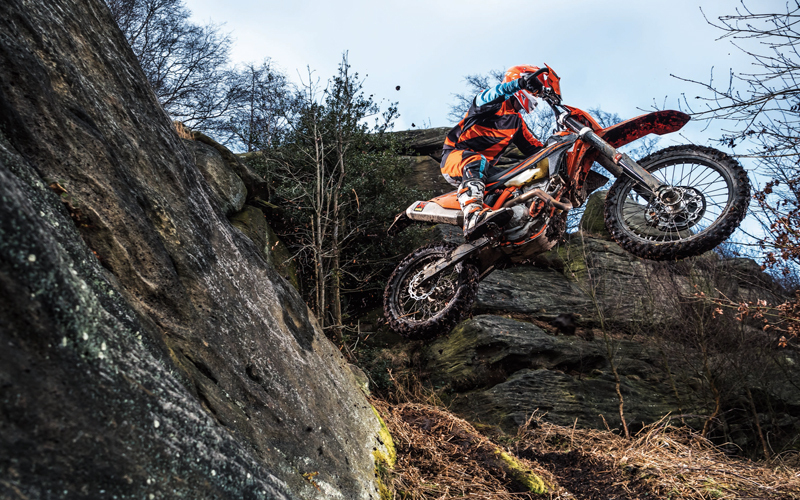 With its all-round talents, the KTM 350 EXC-F is the first choice for Enduro riders, whether they be amateurs or experienced professionals who want to soar ahead of the competition. The state-of-the-art Keihin engine management system with electronic fuel injection features a 42 mm throttle body. Due to the unique position of the injector, power is available instantly and is easy to control. In addition, there are separate systems for cold start and idle adjustment. The rider can also select the appropriate power curve on the optionally available map select switch and activate traction control for maximum grip. The compact DOHC engine benefits from a sophisticated cylinder head design incorporating state-of-the-art technologies. Two overhead crankshafts drive four titanium valves via super lightweight cam followers which are extremely robust as a result of their DLC (diamond-like carbon) coating and feature high durability. In the case of the KTM 350 EXC-F, a rugged 6-speed transmission transfers the power to the rear wheel. Fine-tuned specifically for the needs of Enduro riders, it features widely spaced gear ratios and low-wear shift forks designed to withstand high loads. Yet another factor guaranteeing reliability is the KTM No-Dirt gear shift lever design, which prevents mud and dirt from entering the joint of the lever. The engine management system incorporating a gear position sensor selects the optimum performance setting at all times to match the gear currently engaged and the demands of the terrain. An undisputed advantage during Enduro races – the E-starter fitted as standard to the KTM 350 EXC-F springs into life quickly and reliably even under the most extreme conditions. For model year 2019 features an even stronger Mitsuba starter motor combined with a lightweight lithium ion battery and KTM's proven starter drive. The DDS (damped diaphragm steel) clutch developed by KTM, which has a single diaphragm spring instead of conventional coil springs, requires less effort to operate the clutch. In addition, the damping system integrated directly inside the clutch hub increases traction and extends the life of the clutch. An additional feature is the Brembo hydraulic system, which is one of best out there on the Enduro market. Whether shortly after starting the engine, on long rides or in tough competitive events – the Brembo system operates the clutch reliably and the pressure point remains unchanged, regardless of the operating temperature.